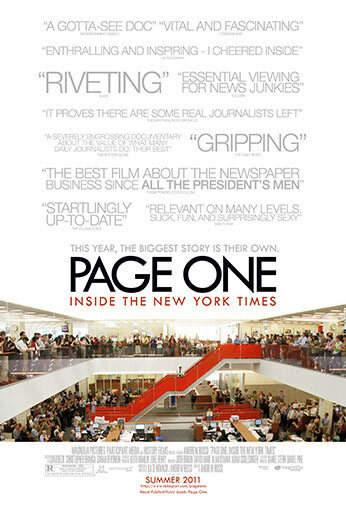 Andrew Rossi’s riveting documentary PAGE ONE: Inside The New York Times, which had its World Premiere at the Sundance Film Festival earlier this year, was acquired by Magnolia Pictures and Participant Media for theatrical release this June. In the tradition of great fly-on-the-wall documentaries, the film deftly gains unprecedented access to the New York Times newsroom and the inner workings of the Media Desk. With the Internet surpassing print as our main news source and newspapers all over the country going bankrupt, PAGE ONE chronicles the transformation of the media industry at its time of greatest turmoil. Writers like Brian Stelter, Tim Arango and the salty but brilliant David Carr track print journalism’s metamorphosis even as their own paper struggles to stay vital and solvent, while their editors and publishers grapple with up-to-the-minute issues like controversial new sources and the implications of an online pay-wall. Meanwhile, rigorous journalism is thriving— PAGE ONE gives us an up-close look at the vibrant cross-cubicle debates and collaborations, tenacious jockeying for on-record quotes, and skillful page-one pitching that brings the most venerable newspaper in America to fruition each and every day.